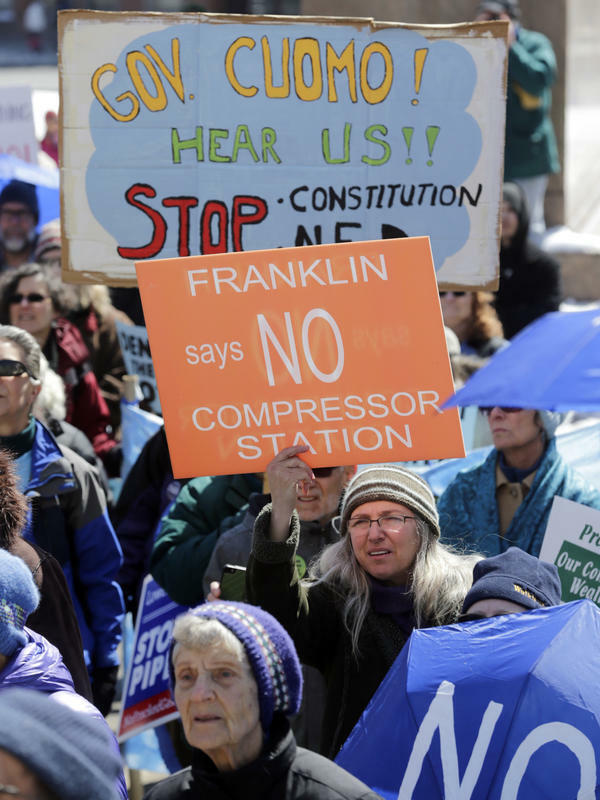 Environmental groups opposing the Constitution Pipeline rally outside the state Capitol on Tuesday, April 5, 2016, in Albany, N.Y.
At a recent protest rally supporters of the No LNG Exports campaign submitted more than 25,000 comments to encourage Gov. Kate Brown and her Department of Environmental Quality to reject the project. "The state of Oregon has the ability to deny the Clean Water Act permit and stop this project once and for all if this project would have negative impacts on Oregon's water ways, which we know it will," says Hannah Sohl, director of the group Rogue Climate. Activists like Sohl want to keep fossil fuels in the ground where they won't contribute to climate change. Blocking construction of infrastructure, such as pipelines, is one way of doing that. If gas can't get to market no one will drill for it. The Federal Energy Regulatory Commission is the primary agency responsible for approving interstate gas pipelines. "You can count on, I think, two fingers the number of gas pipeline projects that FERC has ultimately rejected," says Daniel Estrin, general counsel and advocacy director for the Waterkeeper Alliance. Activists' frustration with the FERC has increased under the fossil fuel friendly Trump administration. That's why Estrin looked for a new way to stop a pipeline in New York, and he found it in Section 401 of the Clean Water Act. It gives states the right to review new projects to make sure they don't harm local water. "So it essentially gives states veto power over federal decisions," says Estrin. But the gas industry argues that's not how the law is supposed to work. "For years the certifications were approved — often conditioned in ways that would ensure states could protect their water quality," says Don Santa, president and CEO of Interstate Natural Gas Association of America. This new legal strategy activists are using changed that. "So it's very different now that it's being used as a sword rather than a shield," says Santa, who argues this pipeline-killing "sword" harms consumers and interrupts interstate commerce. He points to a case last winter when LNG from Russia was delivered to Boston to satisfy customer needs during a cold snap. "When only a few hundred miles away you had the most prolific and most affordable natural gas in the world in the Marcellus Shale — all because you couldn't build the pipe to connect that supply to consumers," says Santa. The industry's effort to stop this new legal strategy in court have failed so far. Now the gas pipeline industry is supporting legislation in Congress. Republican Sen. John Barrasso of Wyoming introduced legislation at the end of July that would limit a state's power in this process, which is ironic given that Republicans generally embrace state's rights. Daniel Estrin of the Waterkeeper Alliance says the legislation is an overreaction. "People are running around with their hair on fire because one pipeline project got rejected because the state determined that it would have too great an impact on water quality," says Estrin. Few people think this legislation has a chance of becoming law because of the states' rights issue. So activists continue to encourage states — usually only those with Democratic governors — to exercise their veto power and stop new pipeline projects. Environmental activists are using a new strategy to block construction of oil and gas pipelines. And so far, this strategy has worked in New York, where construction on the Constitution Pipeline has stalled. Now activists are trying it out in Oregon. NPR's Jeff Brady explains. JEFF BRADY, BYLINE: For a long time, the oil and gas pipeline approval process was pretty boring, dominated by long meetings and detailed consultations. But that's changed. UNIDENTIFIED PROTESTERS: (Chanting) Hey, hey. Ho, ho. LNG has got to go. Hey, hey. Ho, ho. BRADY: Protests like this one recently in Medford, Ore., are common now. This demonstration focused on the Jordan Cove project. It would transport natural gas through a pipeline across the Cascades Mountain Range to the Oregon coast so it can be turned into liquefied natural gas, or LNG, for export. UNIDENTIFIED PERSON #1: The public has submitted over 25,000 comments. BRADY: Those comments are directed at Oregon Governor Kate Brown and her Department of Environmental Quality. This is part of the legal strategy embraced by fossil fuel opponents, like Hannah Sohl of the group Rogue Climate. HANNAH SOHL: The state of Oregon has the ability to deny the Clean Water Act permit and stop this project once and for all if this project would have negative impacts on Oregon's waterways, which we know that it will. BRADY: Activists like Sohl want to keep fossil fuels in the ground, where they won't contribute to climate change. Blocking infrastructure construction, like pipelines, is one way of doing that. If gas can't get to market, no one will drill for it. The Federal Energy Regulatory Commission is the primary agency responsible for approving interstate gas pipelines. DANIEL ESTRIN: You can count on, I think, two fingers the number of gas pipeline projects that FERC has ultimately rejected. BRADY: Daniel Estrin is an attorney with the Waterkeeper Alliance. Activist frustration with FERC has increased under the fossil fuel-friendly Trump administration. That's why Estrin looked for a new way to stop a pipeline in New York. And he found it in the federal Clean Water Act. Section 401 gives states the right to review new projects to make sure they don't harm local water. ESTRIN: So it essentially gives states veto power over federal decisions. BRADY: But that's not how the law is supposed to work, says Don Santa, head of the Interstate Natural Gas Association of America. DON SANTA: For years, the certifications were approved, often conditioned in ways that would ensure that the states could protect their water quality. So it's very different now that it's being used as a sword rather than a shield. BRADY: Santa says this pipeline-killing sword harms consumers. SANTA: Last winter, you had Russian LNG being delivered in New England to satisfy the needs of consumers up there, when only a few hundred miles away, you had the most prolific and most affordable natural gas in the world in the Marcellus Shale, all because you couldn't build the pipe to connect that supply to consumers. BRADY: Efforts to stop this new legal strategy in court failed, so now the gas pipeline industry is supporting legislation in Congress. UNIDENTIFIED PERSON #2: Good morning. I call this hearing to order. BRADY: Wyoming Republican Senator John Barrasso introduced legislation last month that would limit a state's power in this process, which is ironic given Republicans' embrace of states' rights. Daniel Estrin of the Waterkeeper Alliance says the legislation is an overreaction. ESTRIN: People are running around with their hair on fire because one pipeline project got rejected because the state determined that it would have too great an impact on water quality. BRADY: Few people think this legislation has a chance of becoming law because of the states' rights issue. So activists continue to encourage states, usually only those with Democratic governors, to exercise their veto power and stop new pipeline projects. Jeff Brady, NPR News. Transcript provided by NPR, Copyright NPR.